Stylish artwork by James Ryman. 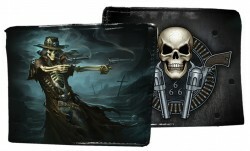 Gunslinger skeleton high quality artwork is on both sides. Wallet with plenty of space for cards. Main compartment divided into two.